Using Hurd-like translators (modules) it is possible to build scalable storage practically arbitrary size. Doesn't deal well with a big number of small files. For example it takes up to 20 seconds to `ls` catalog with 3500 files. It is very difficult to create configuration for performance translators on client which would not cause sacrifice of reading or writing speed. For example optimisation for reads in my case caused archive to be unpacked 22 times slower then on NFS (~11 hours vs ~30 minutes) on 1 AFR on 2 unified nodes configuration. Gluster stores its metadata in extended attributes of underlying filesystem, so for ext2, for example, 'user_xattr' should be enabled. No shared mmap support in libfuse. This means that applications like ctorrent will not work with gluster. Mandatory locking, provided by 'posix-locks' translator does not preent file deletion. Collection of servers grouped together administratively to 'cell'. Each cell consists from volumes (kinda like partitions). AFS root look like this: where 'etc', 'home' and 'tmp' are mounted volumes. There are RW and RO volumes. Server can contain RO copies of other volumes, so if you have RO copy from "dead" server on active server, clients will use RO copies on alive servers. 0-6 distributed RO could exist. Suppose you have three servers: fs1, fs2 and fs3. AFS automatically tracks volume location, so it is possible to move volumes from one server to another without user to notice anything. Difficult to setup '/' on AFS, which cannot store special files. When using the fcntl(2) command F_GETLK note that although the PID of the process will be returned in the l_pid field of the struct flock, the process blocking the lock may not be on the local node. There is currently no way to find out which node the lock blocking process is actually running on, unless the application defines its own method. GFS2 does not support inotify nor do we have any plans to support this feature. We would like to support dnotify if we are able to design a scheme which is both scalable and cluster coherent. When a data-server or metadata-server fails, filesystem goes down. 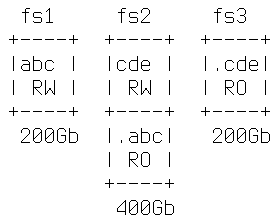 when raid in degraded mode, the fs is still operable, but the speed of entire fs will be limited to the slowest device. For example, if you have 4 nodes and one of them is running in degraded mode, all nodes will run at that same speed, but the FS will still be fine. Patches should be applied on kernel from linus.